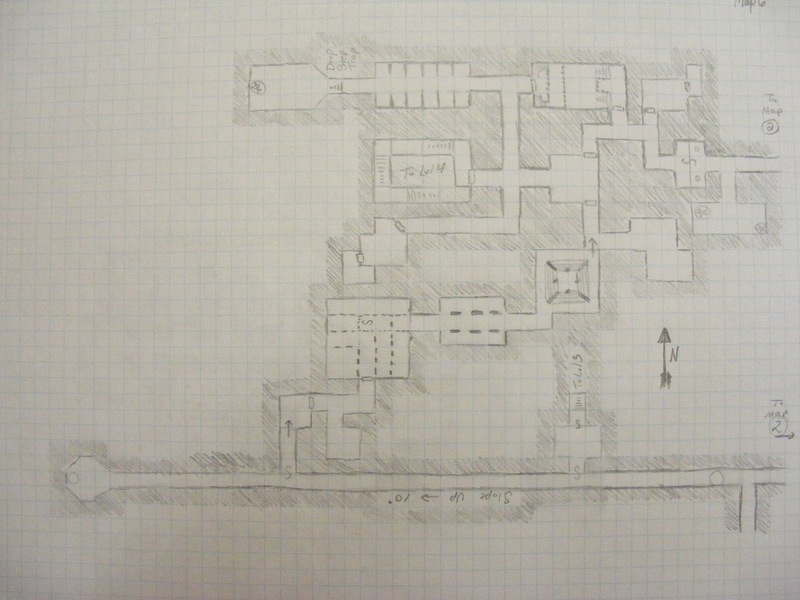 The first level of my megadungeon is actually a rather small one, which I've posted already. 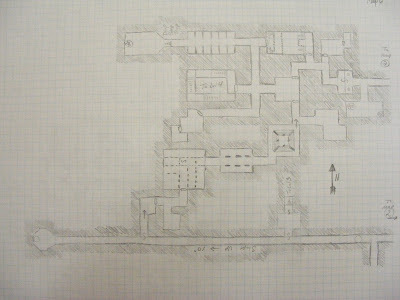 I've also posted the first map below, which is the beginning of the second level. 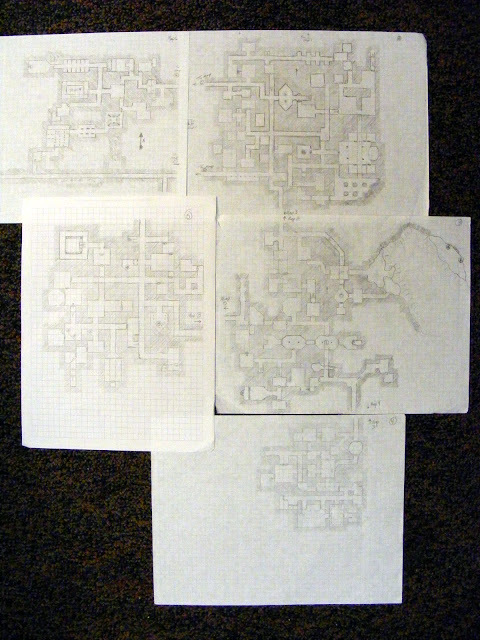 However I think I've finally finished mapping the rest of the second level! I need to redo this one on the same size graph paper. 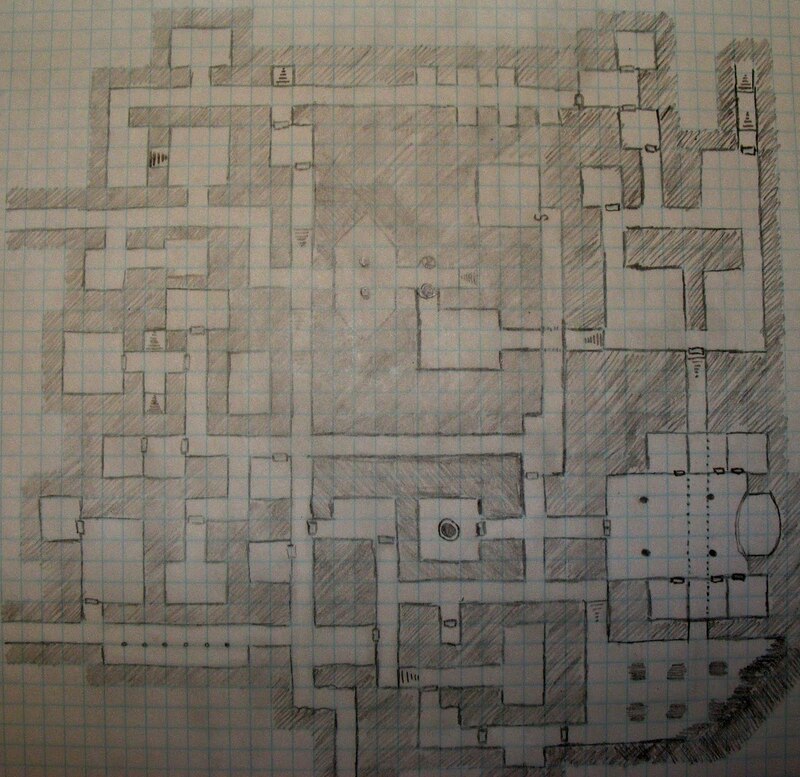 One of the things I'm trying really hard not to do is to confine myself to the shape of the graph paper. If it feels right to have a weird section branch off at an inconvenient location, that's ok! I have more graph paper! 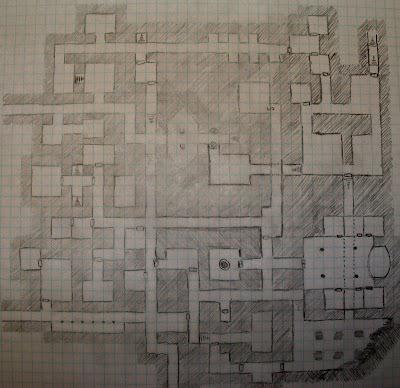 The doorway across the chasm in Map 3 will lead to some other section of the dungeon, tougher than level 2 definitely... but I haven't decided what I want over there yet, so it remains unmapped. As I only get to play my 4e game with my cousins about once a month, I was thinking about doing a play by post game with them, however I've never done a Dungeons and Dragons game by post before. Have any of you ever run games like that? What is it like? Do you have or know of a good example for me to look at? The sprites are not just afraid of Bark Wilder-they’re petrified! The basic story is that a no-good, dirty rotten gnome has stolen a faerie clan chief's staff - a wand of wood which among other powers, can turn a living creature to wood. The gnome (actually a spriggan), Bark Wilder, then sells these "statues" to the PCs for incredibly cheap prices considering the masterful quality. Whether the PCs buy the statues or not, the Faerie clan wants them to beat up Bark and return their staff. I ran this adventure from Dungeon Magazine #73 only once, and it was one of the last times I played D&D. It didn't go well. They bought several of the wooden statues, and then didn't want to give the wand (or the statues) back after they killed Bark. Now, there are a number of things I really like about this little adventure. First off, I like that Bark is a nasty little fay, and that he has 4 other nasty little fay helpers. The adventure calls them Shikes and describes them as 4" tall fairies with chitinous full plate armor with Trojan shaped crests of the same material sharpened for attack, and wings that fold out of the armor like a beetles. 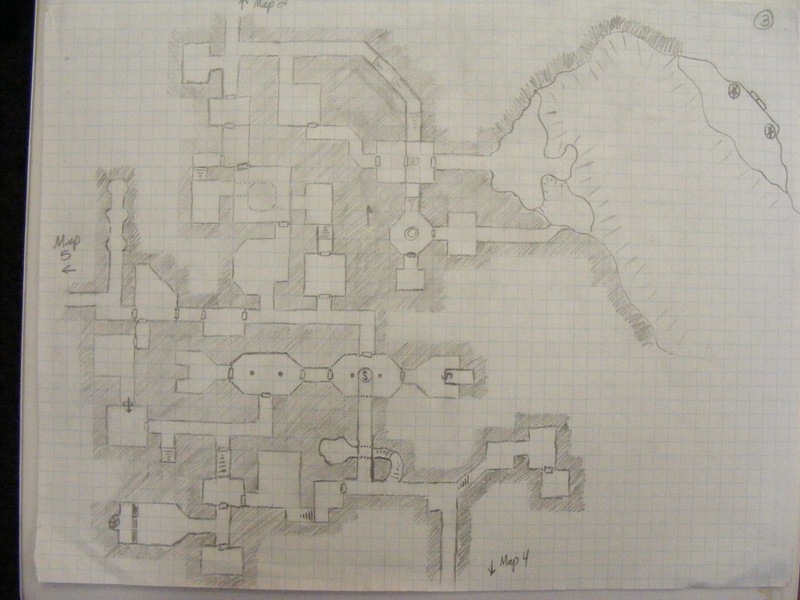 I had a great time visualizing those nasty little sprites flickering in and out cutting up the adventurers. I also like how it brought the fairy to my game. Most of my games tended toward much less magic creatures like orcs and kobolds. Even the elves of my games in that era were rather terrestrial. It was an aspect that I again got away from with 3rd Edition, and I'd like to bring into my megadungeon and maybe even my 4e game. The original Dungeons and Dragons Monster Man video came out a while ago, and a new one was released just a little while ago. If you haven't seen these before, you really need to check them out! I'm curious how much audio improvisation you add to your game? After watching these videos I'm more inclined to do more. It seems that the surface of Mars was shaped by water some 4 billion years ago. John Cater of the University of Paris lead the team that did the research. So I guess his Barsoomian adventures took him not only to another world, but also back in time! Feris set the candle in the alcove. His companions stood around him, looking out into the darkness of the huge hall. Somewhere, just outside of the torchlight, were dozens of moving things. Things that clicked and hisseed, a hard wet sound that made Nimble's hair stand on end. Feris opened his water skin, and poured a drop onto the candle. The hall was quickly filled with wavy reflected bluish light, revealing a swarm of gnashing kruthiks. The creatures were clearly agitated by the light, and they crept back into the shadows. The Elemental Candle (Water) doubles the range of any light within 20 feet (4 square) of the candle, and causes any creatures within the newly expanded area of light (but not the original radius of the light) to take a +4 vs will attack/save versus spells or back out of the area of the light. 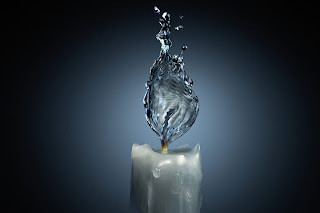 The candle must be resting on a solid surface to be used, and clean water must be used to light it, and it will "burn" for a total of 2 hours. This counts as a Level 6 magic item. In the category of Laugh Out Loud entry: anarchist. In the category of Longest entry: Boric G.
In the category of Best Fathers Day Entry: dogrodeo. In the category of Library Gaming entry we have a tie! seaofstarsrpg and shootthemoon. A big thanks to all those who entered my first contest. The winner will be chosen and announced tonight! I had several people recommend me this book... after I'd already finished it, which I thought was funny. Unfortunately I didn't enjoy it as much as I wanted to. The problem is that the author very obviously has mixed feelings about D&D and the role (or is that roll) it played in his life. While he tries to look back at it and laugh, it also seems like he blames it for how poorly things went for him as a child. At the end, after writing most of he book he tries to game again, and the group he finds as an adult was pretty much as dysfunctional as the one he played with as a child. I think that's sad, and I hope that since then he's gotten the chance to play with some well adjusted people. 3.5 hours to win The Elfish Gene! You still have time, but it's running out! It's interesting seeing how the characters are working together more so than during our first game. They're working really hard to make sure that they get the rogue the flanking bonus, and that the warlord is there to give him a free basic attack. In asking about what they enjoyed and didn't after the game, they both said that the last fight with Blagron and the 3 sharpshooters was rather brutal. I followed up asking if they enjoyed it in spite of that? The responce it got back was that it was "Awesome, but brutal" so I think it's ok. Just so long as I don't make every fight that brutal. This was the first time the terrain really favored the bad guys. Most of the time it's been either in the players favor, or rather neutral. I must admit, knocking the rogue down a 10 foot drop, shooting him with a crossbow, and then having 2 guard drakes attack him... That was kind of brutal. As for changes made, there wasn't actually much different from the adventure as written. I did add the goblin guards in the ruins, and I gave one of the Snowden's wand. This was in place of the holy symbol of battle that was in the dig site originally. I adjusted the hobgoblin torturer's armor to be leather instead of hide for the thief to use. And lastly I changed the +1 wand that Blagron had (for no good reason) into an Amulet of Protection +1. Time wise for both games we played for about 9 hours. In that time we got through 7.5 encounters. The first game we got through 6 encounters plus a bunch of actual role playing. The brave adventurers have decided to rid the town of Winterhaven of this Kalarel character who seems bent on opening some rift to a bastion of Orcus in the Shadowfell. To do this, they needed to go to the ruins of Sir Keegan's Keep. The trip to the keep itself was uneventful. Once they arrived however, things started with a bang! Using the Remix encounter the party encountered a skirmisher, a trio of dragonshields, and a wyrmpriest. However, since they had already wiped out the kobolds in the lair, I reskinned them into goblins. There was no mechanical change, I just called them goblins. All of the difficult terrain seriously limited the battlefield. There wasn't really any reason for the players to enter very far into the difficult terrain, so most of the action happened in the cleared area. Another change I made was to give the wyrmpriest Snowden's Wand. Upon entering the dungeon they immediately noted both the trapped center of the room and the surprised goblin. He, and his companions were quickly and quietly dealt with. They decided to explore through the hall to the northwest. Hearing the screaming of a tortured being they burst through the door to the torture chamber. The rogue advanced on the hobgoblin torturer, the paladin on the goblin next to the iron maiden, and the warlord (using those lovely trade out rules) offered alternately the paladin and the rogue basic attacks. The paladin knocked the goblin into the iron maiden and slammed it shut. The goblin shoved his way out and tried to stick the paladin with his spear and missed. The Paladin then kicked the goblin back into the iron maiden, and latched it shut trapping him for the rest of the battle. The rogue hopped over the now dead kobold, and kicked the torturer back up against the firepit, and then sliced at his face, causing him to fall back into the flames. Around this point the warlord ended up locked in the cage, while one of the goblins went to release his friend in the iron maiden. The wizard put a stop to that, and further added to the smell of charred goblin with a well placed burning hands spell. That's right, the wizard cooked the goblin in the iron maiden!! The hobgoblin pulled himself out of the fire, grabbed a poker, and swung at the halfling. The halfling ducked out of reach, and stabbed one of the goblins. The paladin came around and breathed acid on the already burned hobgoblin (and a goblin), who promptly fell backward into the firepit, dead before his body hit the coals. The remaining goblin was then quickly dispatched. After dusting themselves off and discovering the treasure (slightly burnt magical leather armor for the thief! ), they then proceed to interrogate the goblin that was in the cell. The creature named Splug offered to help them out by carrying things and showing them around if he was freed. With but a moment of hesitation they agreed. Not to the carrying things, but as a guide. Splug spent a few of his first moments of freedom kicking the dead body of the torturer. Splug then told the party about the chief, the diggers, the nasty big insect things, and the "ghosts". Splug was very vague on a lot of details, mostly because there was a lot he didn't know. They decided that they would come back and deal with the chief later. Luckily for the party, the sound of screaming, cursing, etc. was usual enough coming from the torturer that no one came to investigate. They then moved to the southwestern area, fought some zombies, continued further south and fought a lot of skeletons. Due to the party's ability to deal with large numbers of clumped skeletons I turned up their refresh rate so that new skeletons would pop out every 3 rounds rather than every 5. The paladin failed his religion check when he saw the alter at the end of the corridor. 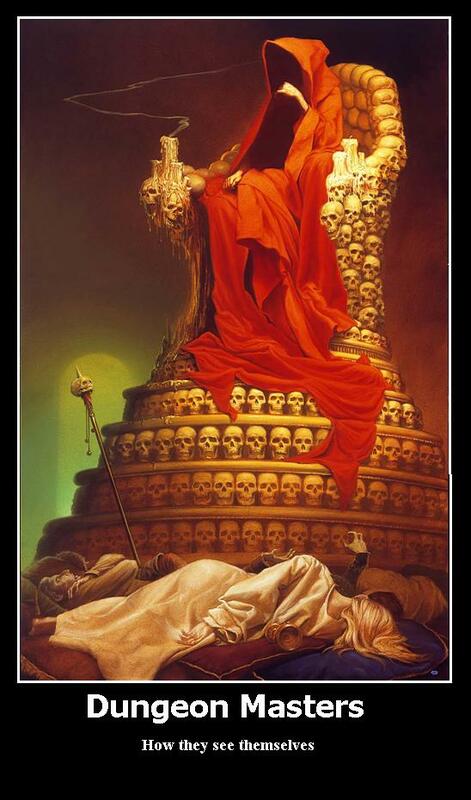 The wizard on the other hand knelt right down, and the skeletons stopped. Sir Keegan. Ok, I'll admit I barely attempted the "skill challenge". I made them roleplay it out, with only a couple of dice rolls. The paladin again failed a religion roll. Clearly he'd spent more time at arms practice than at temple study. Either way, the paladin got Aecris. From there the adventurers decided to take down the goblin chief. They returned to the hall outside the torture chamber, and the rogue sneaked through the door and down the hall to scout. He saw the 2 guards, went back to get the wizard. Unfortunately the wizard wasn't nearly as stealthy, and the goblins flipped the table they were sitting at to use as a barricade, and called out an alarm. The rest of the party ran in and they dealt with the goblins as they arrived pretty handily. When Blagron finally showed up, he managed to get himself into position to flank, and promptly missed all of his attacks. As the rest of his troops fell he decided that running away was safer than facing a bunch of heavily armed and armored thugs. The party searched through the goblin compound, and discovered an amulet of protection locked in the chest under Blagron's bed. Then they discovered the secret door. They figured there had to be one, since Blagron ran into his room, and there wasn't a way out that they could see. The secret door lead them down a tunnel which brought them around to the dig site. Blagron and the sharpshooters were waiting for them atop some of the further pillars while the guard drakes snapped at them from below. The party and the goblins exchanged some ranged attacks, the party getting the worse of it. The rogue got tired of it, and decided that things would go better face to face. He ran across the first wooden plank, along the first pillar and ended up on the second plank. The goblin with Blagron on the second pillar decided to kick the plank out, dropping the rogue 10 feet to the ground. He landed poorly (max damage) and while he was thinking about standing up, the same goblin looked over the edge at the halflings prone form, and shot him with his crossbow to add further injury to his already bruised ego. Then he was pounced on by the guard drakes dropping him into unconsciousness. Splug, thus far only managing to flank opponents, not actually connect with any of them, dropped down the ladder and rushed to the rogue's aid. He yet again failed to hit, but it did serve to keep the drakes from focusing on the unconscious halfling. The paladin tried to follow the rogue across the first plank, but it snapped like dry matchsticks under his weight. His draconic sturdiness kept him from much harm, and he then opted to charge the other drake. Following all that Blagron hauled his corpulent form and lept over the gap to the first pillar to get a better shot at the wizard who had been pestering him with magic missiles. Unfortunately for him, the warlord jumped from the doorway onto the first pillar, and came down hard with his Thundering Longsword upon Blagron's head, and blasting him over the edge of the pillar. His head made a meaty thwack upon the uneven ground as his sightless eyes stared up at his slayer. The paladin revived the rogue, and the room was quickly finished up before we called the game for the night. Just a reminder to enter to win a copy of "The Elfish Gene". Entries are due by the 18th! The air chilled as the goblin stretched out her clawed fingers. Small crystals of ice sparkled in the air as she slowly closed her fingers, wrapping them around a quickly growing icicle. With a flick of the wand a blueish bolt shot out, catching the charging barbarian solidly in the chest. His skin paled, and his charge lost it's momentum. Moments later his overly pale chest was pierced with black arrows and streaked with crimson. A second blast emanated from the wand, the shot corkscrewing along it's path, until it connected with the gnomish priest. The force of the impact knocked him to the ground, and all around his fallen form slick white frost. The spear and shield who was supposed to protect him lost his footing as well. They both suffered mightily as her cutters did their job. Property: Gain a +1 item bonus to damage rolls when you use this wand to attack with a power that has the cold keyword. Level 13 or 18: +2 item bonus. Power (Daily ✦ Arcane, Cold, Implement): Standard Action. As the wizard’s Icy Terrain power. Just a reminder to enter to win a copy of "The Elfish Gene". Entries are due by the 18th! That means you have 6 days to go! No, this post isn't about antagonistic DM's, but rather about getting the chance to game as a player rather than as a DM. It's about which side of the screen I sit on most often, and why. For most of the time I've played RPGs I've been the DM (or GM, or storyteller, etc.). In elementary school it was because I was the one with the books. I didn't get to play at all during middle school, so I spent a lot of time reading the rule books, and in doing so, learned the rules really well. After the first game I played during high school I was asked to DM. From that point on, I was usually the DM. The times I spent on the players side of the screen were more often than not, less enjoyable than I'd hoped they would be. I always strive to bring the best game I can to the table, especially as a DM. I have, on a couple of occasions, called off a game and just done a movie night when I knew that I not only wouldn't be bringing my "A" game, but would actually run a terrible game. When I sit on the other side of the screen, I want to feel that level of commitment, and there have been times that I have felt it. There have also been times when someone wants to run something and then we all board the unfun railroad. The problem is the balance between those two. There isn't any. Most people when they aren't frequent DMs run horrible games. Maybe that's an exaggeration, and I know I always try to enjoy myself when i don't DM, but too much of my brain is thinking "I'd have done that differently, I'd have done it better!" that it gets in the way. So I guess a lot of it comes down to the fact that I'm a DMing snob. I'm curious what your experience is. My impression is that most bloggers are DMs, but maybe only part time. I've set up a poll off to the right, and I'd love to hear back about why you DM. I have a copy of The Elfish Gene by Mark Barrowcliffe that has only been read once, and it can be yours for free!! Ok, it will require a little something. Since The Elfish Gene is about the authors childhood introduction to D&D and how it impacted his life, I want you to leave a comment and tell me about how you were introduced to D&D (or whatever your first RPG was), and why you kept playing. The winner will be chosen by my wife, and the book will be mailed to them anywhere in the world. I'm afraid, as interplanetary and interdimensional postage is prohibitively expensive, I must limit this to terrestrial addresses only. This contest will be open from the time of the posting until 6/18/10 11:59pm EST. As I get ready to run my second 4e game session, I thought I would spend a little time talking about how I get ready for the game. Since I am running a module, rather than something I developed myself, I spent a fair amount of time rereading the adventure itself. I also reread the quickstart rules, as this was my first time actually using the 4e engine. I then spent some time looking at the various reviews and remixes of the module. This probably isn't something I'd do for future adventures, but I wanted to be sure I was on my game, and I knew there were some big errors that needed some workaround. There is a Printable DM Encounter Manager PDF that I found a while back. I printed out the second page for every encounter that I was going to run for the game, and filled it in with the various monsters, their hit points, bloodied value, and I pre-rolled their initiatives to save a little game time. Rather than doing each creature individually for initiative, I rolled once for each type. So all the minions moved at the same initiative, but it might not be at the same time as the brutes, or the skirmishers. I have a fairly large collection of minis, but I am sorely lacking in Kobolds. Since I wanted to use minis rather than tokens, I opted to use the few kobolds I had, and goblins for the rest. I have lots of goblins. Some are D&D minis, some are heroquest minis, and some are from Lord of the Rings. More than enough to differentiate the different types of little guys that I needed to represent. I also pulled out the other minis I'd need, including characters, undead, etc. and I set them aside within easy reach. The adventure comes with several poster maps, which I kept handy. 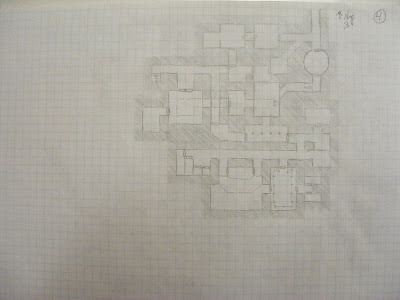 However I didn't like the layout of the A3 encounter, and so I used a big sheet of poster paper to redraw that map closer to the way it was in the remix. That about covers the prep I did for the adventure. As I'd said in my previous post, we ended up going further than I thought we would, so I did have to scramble a little bit, but I luckily had several extra DM Manager sheets handy, so it didn't slow us down too much. For today's game, as we delve down into Sir Callibran's Keep I'll be using my new chessex battlemat. This means I'll be drawing as we go. I hope this doesn't slow us down too much. I also went through the dungeon and again filled out the necessary DM Manager sheets for the various encounters. Lastly, I looked through the encounters at what treasure was offered, and where, and did a little tweaking to make it better fit my players, especially the magic items. With no cleric, a holy symbol doesn't do a whole lot of good for anyone. And a level 1 wand? Really? So now I'm ready to play. I'll let you know how it goes! I have never seen a single episode of Lost, but I have DMed a lot of D&D. One thing I've noticed is that players presume you KNOW everything, and are only doling out info as you see fit. Much of the time this is how the players see the DM. The truth is that (in my experience) much of the time the DM has only a vague idea whats currently going on, let alone what is to come. How does this relate to Lost? Well, if you have to ask, you probably haven't been playing attention the last 6 years. It's a show that hints at lots and lots of things, and judging by what people are saying about the last episode, it either explained some stuff, or didn't explain enough stuff, or it didn't mean anything in the first place. Either way, the fan base has been speculating about the meaning of the show since pretty much the beginning. They've come up with wild theories to try to make sense of it all, because they presume that the show made sense, that the writers had a plan, and that if they could figure out what that was, that it might reveal some deeper meaning to the shows mythology. Why is this important? Because it means the players will fill in the blanks for you. Give them something to grab hold of. Repeat a motif, a number, give them a shadowy antagonist, and let them fill in the blanks. What does that red diamond in a white circle mean? Why is it repeated? Chances are that the ideas they come up with together will be more exciting that what you come up with on your own. Special note to players - Please conjecture! Come up with outlandish ideas for what is going on. You never know when you might be right! What non-game media have most inspired your games and how? My mother would read me Greek myths as my bedtime stories. I was always fascinated by the minotaur and the labyrinth (I drew lots of mazes as a kid), and the tales of Jason and Hercules. This cartoon show was a big influence on my early D&D games, as it was running at exactly the same time as I started playing D&D. Even then I did realize that I couldn't lift things straight from the show, because my friends watched it too. Prior to this series I was not a reader. I could read, and did when I needed to, but never for pleasure. I was assigned to read The Lion, The Witch, and the Wardrobe for school, and I fell in love with the series borrowing them from the library, and devoured them as quickly as I could lay my hands on them. This also corresponded with my introduction to D&D, and it lead my to consume as much fantasy as I could get my hands on. You know the type; older action adventure, sword and sandal, biblical, and silly sci-fi movies. I spent way too much time watching them, and the sense of some of the over the top stuff that can go on in a game. 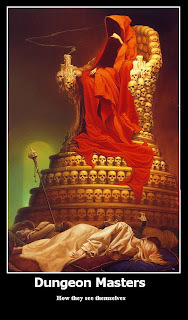 More currently my inspiration comes from some of the amazing art that I've seen both online and in real life, as well as the vast number of books I've read in the last 2 decades. Movies continue to be an inspiration. My exposure to music has exponentially expanded since I first got into D&D, and now the right track can set my mind alight with inspiration.